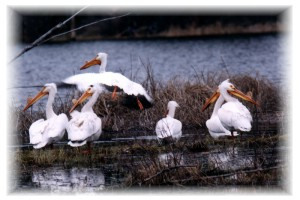 Stum Lake, within White Pelican Provincial Park, is closed to the public from March 1 - August 31 every year to protect the White Pelican nesting colony. Stum Lake, within White Pelican Provincial Park, is closed to the public from March 1 - August 31 every year to protect the White Pelican nesting colony. Canoeing, boating, hunting, trapping, discharge of firearms, aircraft operation below 600 metres in elevation, and aircraft landing are prohibited on Stum Lake (located within the park) from March 1st to August 31st every year due to the American White Pelican nesting there. This colony of American White Pelicans is the only nesting colony in British Columbia. They are very sensitive to disturbance; disturbances can result in the loss of all young. Pelican viewing opportunities exist at Nazko Lake Park and in other lakes in the Chilcotin. White Pelican Park is located approximately 60 km northwest of Williams Lake on the Chilcotin Plateau. History: White Pelican became a Class A park in 1971, and was expanded as a result of recommendations in the Cariboo-Chilcotin Land Use Plan. In addition to providing security for the pelican nesting sites, the park also protects moose and aquatic fur-bearing habitat. The park will continue to be managed exclusively to support the provincial pelican population. Approved Purpose Statement and Zoning Plan [PDF] for White Pelican Provincial Park is available in pdf format.